Imagine living in a country whose government decided to block any scientific discovery coming from abroad. Even worse: imagine living in this hypothetical country, at the exact time when the most radical revolution of human knowledge in history is taking place in the world, a major transformation bound to change the way Man looks at the Universe — of which you ignore every detail, since they are prohibited by law. This was probably a scientist’s nightmare in Japan during sakoku, the protectionist policy adopted by the Tokugawa shogunate. 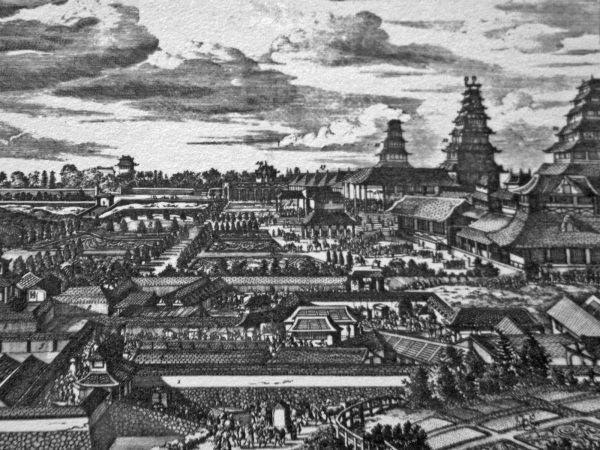 Enacted around 1640, officially to stop the advance of Christianity after the Shimabara rebellion, this line of severe restrictions was actually devised to control commerce: in particular, what the Shogun did was to deny access and trade above all to the Portuguese and the Spanish, who were considered dangerous because of their colonial and missionary ambitions in the New World. China, Korea and the Netherlands were granted the opportunity of buying and selling. Being the only Europeans who could carry on trading, in the enclave of Dejima, the Dutch established with the Land of the Rising Sun an important economic and cultural relationship which lasted for more than two centuries, until the sakoku policy was terminated officially in 1866. As we were saying, Japan ran the risk of being cut off from scientific progress, which had begun just a century before, in that fateful year of our Lord 1543 when Copernicus published De revolutionibus orbium coelestium and Vesalius his Fabrica — two books which in one fell swoop dismantled everything that was believed was above and inside Man. 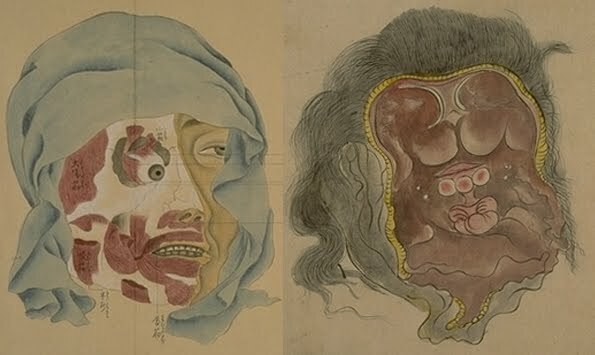 If the nightmare we previously mentioned never became true, it was because of the Rangaku movement, a group of researchers who set out to carefully study everything the Dutch brought to Japan. 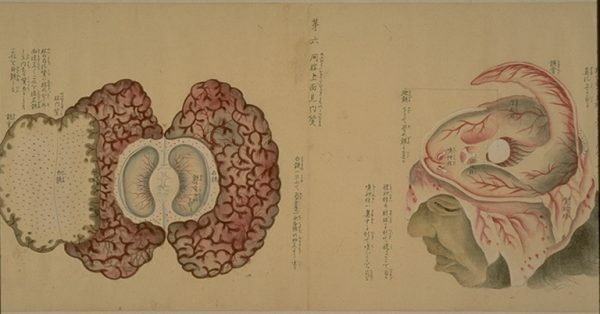 Although for the first eighty years of “isolation” the majority of Western books were banned, ideas kept on circulating and little by little this quarantine of culture loosened up: the Japanese were allowed to translate some fundamental works on optics, chemistry, geography, mechanical and medical sciences. 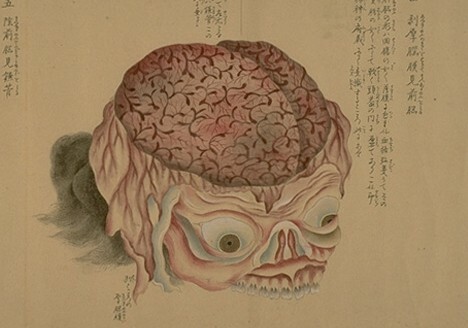 In the first half of the XIX Century there were several Rangaku schools, translations of Western books were quite widespread and the interaction between japanese and foreign scientists was much more common. Medical studies were recognized since the beginning as a field in which cultural exchange was essential. 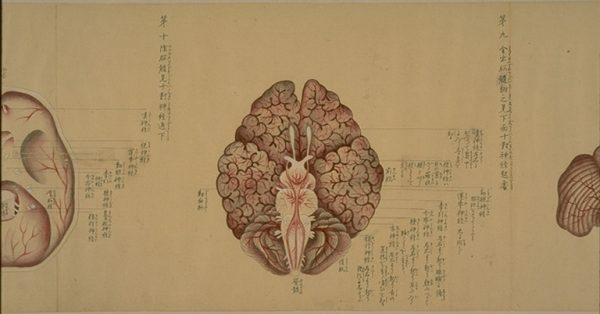 In Japan at that time, physicians followed the Chinese tradition, based on religious/spiritual views of the body, where precise anatomical knowledge was not seen as necessary. 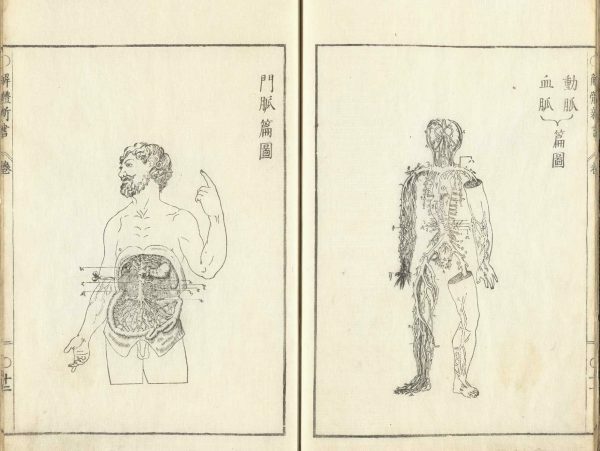 Human dissections were prohibited, according to the principles of Confucianism, and those doctors who really wanted to know the inside of the human body had to infer any information by dissecting otters, dogs and monkeys. 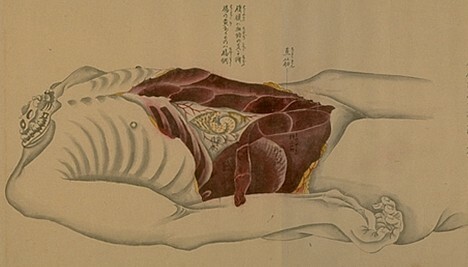 The very first autopsy, on an executed criminal, took place in 1754 and was conducted by Yamawaki Tōyō. 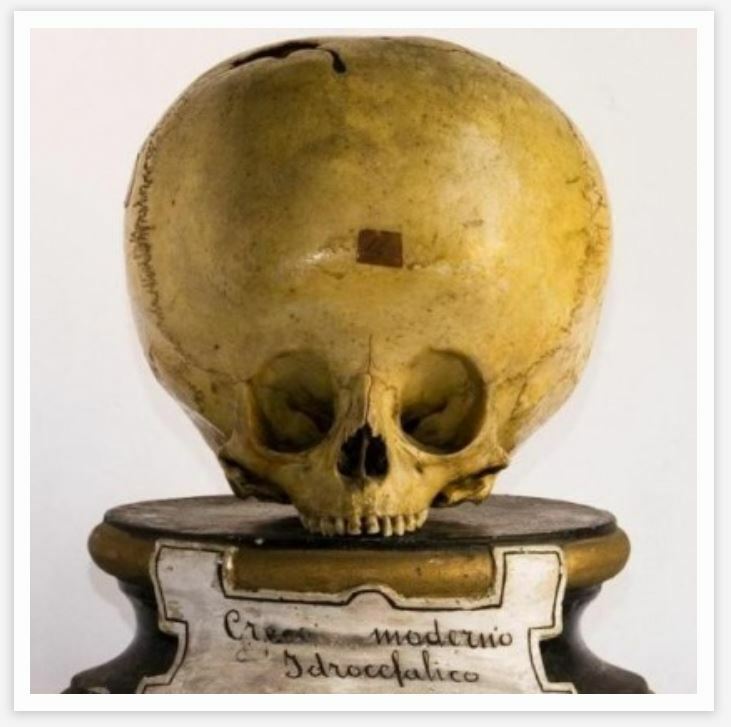 The dissection itself was carried out by an assistant, because it was still a taboo for higher classes to touch human remains. Theories may be overturned, but how can real material things deceive? When theories are esteemed over reality, even a man of great widsom cannot fail to err. When material things are investigated and theories are based on that, even a man of common intelligence can perform well. 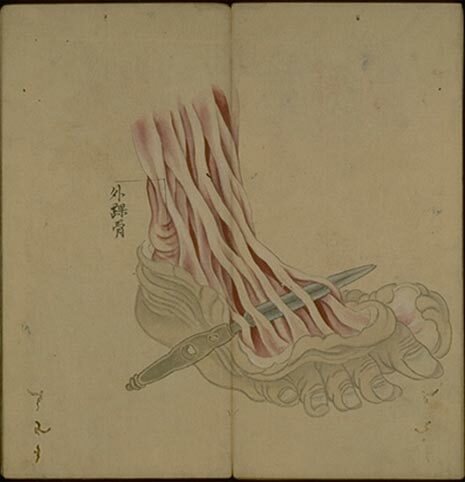 In 1758, one of Yamawaki’s students, Kōan Kuriyama, conducted the second dissection in Japanese history, and was also the first physician to cut up a human body with his own hands, without resorting to an assistant. Ryotaku opened the book and explained according to what he had learned in Nagasaki the various organs such as the lung called “long” in Dutch, the heart called “hart,” the stomach called “maag” and the spleen called “milt.” They looked so different from the pictures in the Chinese anatomical books that many of us felt rather dubious of their truths before we should actually observe the real organs. […] Comparing the things we saw with the pictures in the Dutch book Ryotaku and I had with us, we were amazed at their perfect agreement. There was no such divisions either as the six lobes and two auricles of the lungs or the three left lobes and two right lobes of the liver mentioned in old medical books. Also, the positions and the forms of the intestines and the stomach were very different from the traditional descriptions. 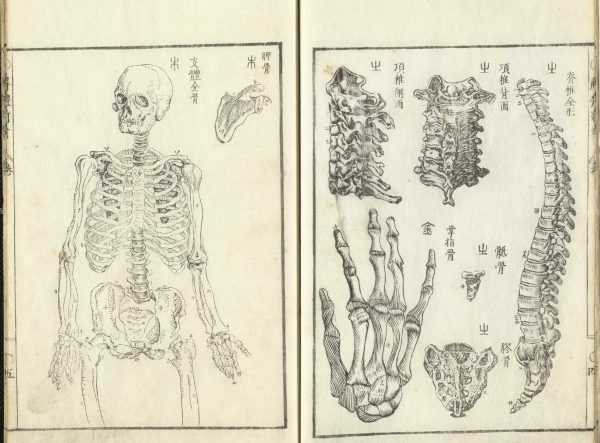 [Even the bones] were nothing like those described in the old books, but were exactly as represented in the Dutch book. We were completely amazed. Genpaku spent the following three years translating the Dutch textbook. The task had to be carried out without any knowledge of the language, nor dictionaries available for consultation, by means of constant interpretations, deductions, and discussions with other doctors who had been in contact with the Europeans in Nagasaki. 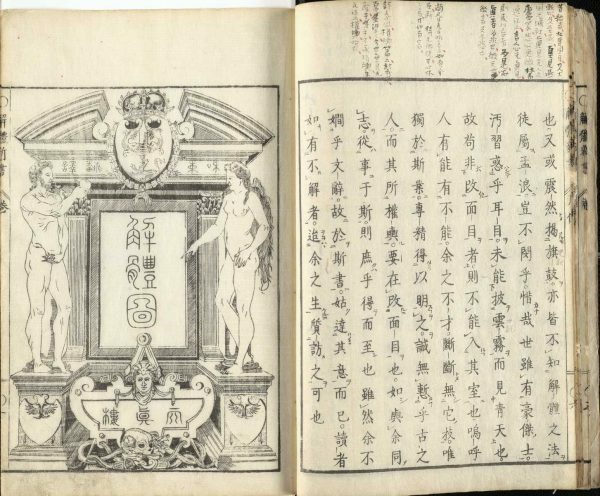 Genpaku’s colossal effort, similar to an actual decryption, was eventually published in 1774. 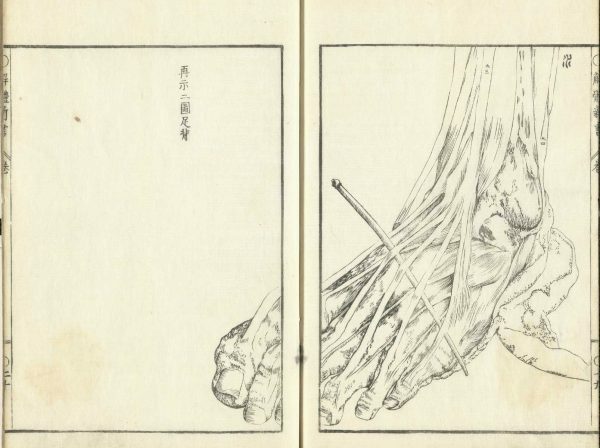 The Kaitai Shinsho was the first Japanese illustrated book of modern anatomy. 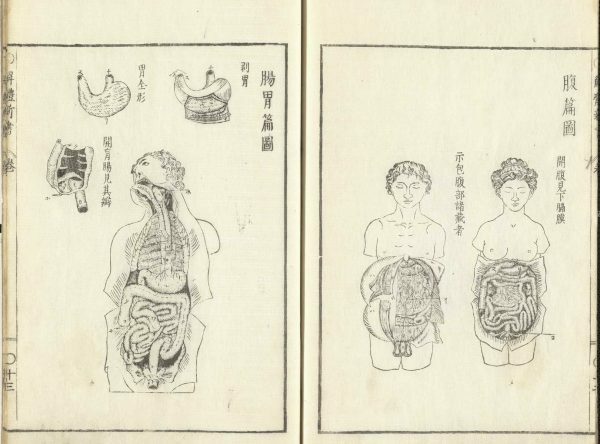 As Chinese traditional medicine gradually began to pale in comparison to the effectiveness and precision of knowledge coming from Europe, in Japan the practice of dissection became widespread. 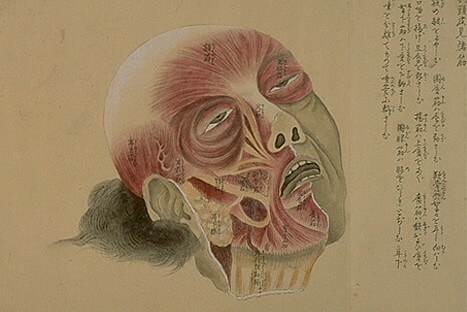 This was the context for the real masterpiece of the time, the Kaibo Zonshishu (1819), a scroll containing 83 anatomical illustrations created by Doctor Yasukazu Minagaki. 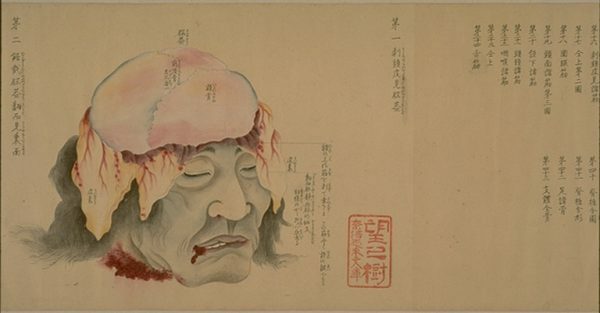 Minagaki, born in Kyoto in 1785, attended public school and became a physician at a clinic in his hometown; but he also was a better and more gifted artist than his predecessors, so he decided to paint in a meticulous way the results of some forty autopsies he had witnessed. 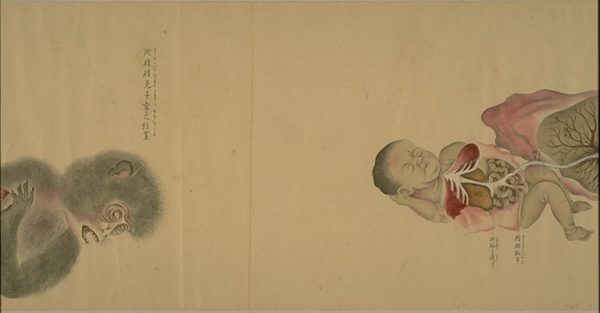 The scroll was part of a correspondence between Minagaki and the Dutch physician Philipp Franz von Siebold, who praised the admirable drawings of his Japanese collegue. 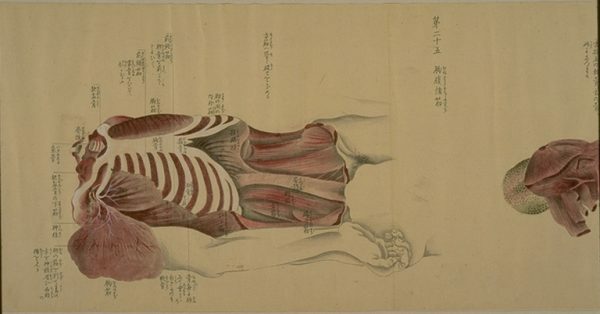 There are several online articles on the Kaibo Zonshishu, and almost all of them claim Minagaki was obviously distant from the classicist European iconography of the écorchés — those flayed models showing their guts while standing in plastic, Greek poses. The cadavers dissected here, on the other hand, are depicted with stark realism, blood trickling down their mouth, their faces distorted in a grimace of agony. But this idea is not entirely correct. 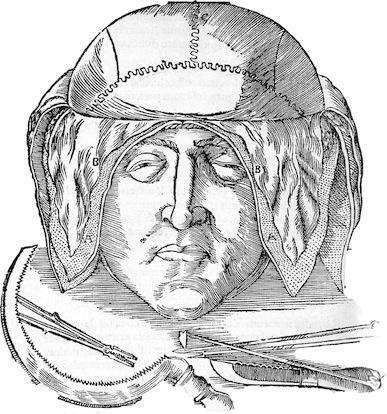 Already since the XVI Century, in Europe, the écorchés paired with illustrations of an often troubling realism: one just needs to look at the dissection of the head by Johann Dryander, pre-Vesalian even, but very similar to the one by Minagaki, or at the cruel anatomical plates by Dutch artist Bidloo in his Anatomia Hvmani Corporis (1685), or again at the corpses of pregnant women by William Hunter, which caused some controversy in 1774. 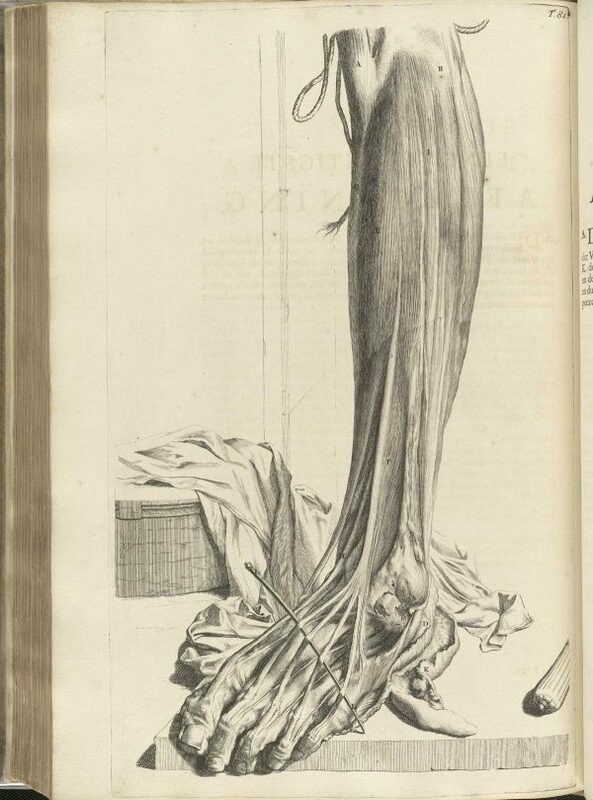 …was taken from this illustration by Govand Bidloo (Ontleding des menschelyken lichaams, Amsterdam, 1690). 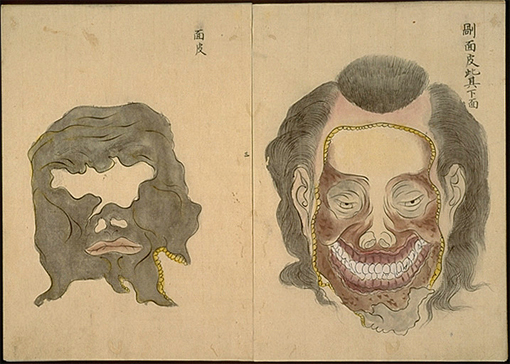 Anyway, aside from aesthethic considerations, the Kaibo Zonshishu was probably the most accurate and vividly realistic autoptic compendium ever painted in the Edo period (so much so that it was declared a national treasure in 2003). When finally the borders were open, thanks to the translation work and cultural diffusion operated by the Rangaku community, Japan was able to quickly keep pace with the rest of the world. And to become, in less than a hundred years, one of the leading countries in cutting-edge technology. 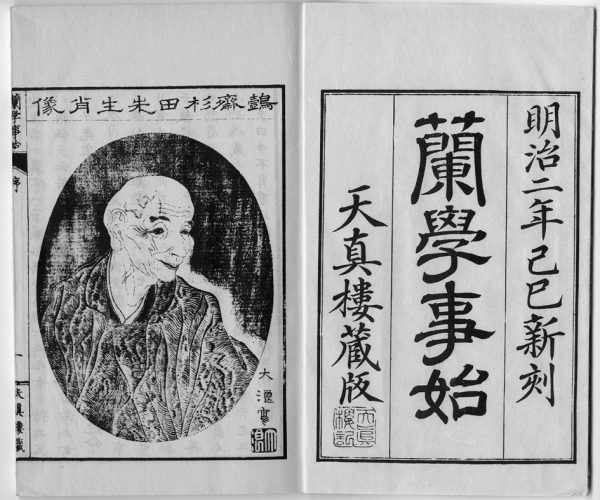 You can take a look at the Kaitai Shinsho here, and read the incredible story of its translation here. 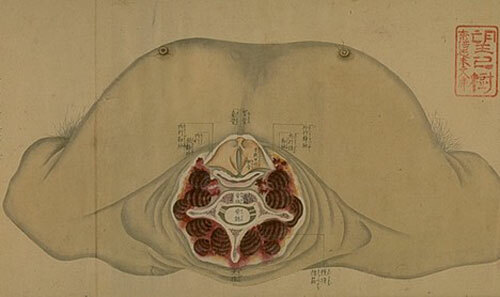 On this page you can find several other beautiful pics on the evolution of anatomical illustration in Japan. This entry was posted in Books & Literature, MondoMacabro, Anomalous Science, Weird Art and tagged anatomia, anatomica, anatomical, anatomy, autopsia, autopsy, bidloo, body, book, cadaver, cadavere, chinese, cinese, copernico, copernicus, corpo, corpse, dejima, dissection, dissezione, dutch, edo, european, europei, genpaku, giappone, giapponese, history, illustration, illustrazione, japan, japanese, kaibo zonshishu, kaitai shinsho, kyoto, libro, medicina, medicine, minagaki, nagasaki, netherlands, olanda, olandese, period, periodo, plate, rangaku, revolution, rivoluzione, sakoku, science, scientific, scientifica, scienza, shogun, storia, tavola, testo, text, tokugawa, traduzione, translation, vesalio, vesalius, yamawaki. 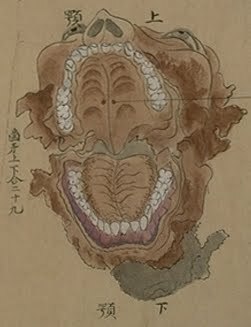 Molto interessante, per combinazione pochi giorni fa ho visto un ciclo di tre documentari di “aCdC” (RaiStoria, introdotti dal prof Barbero), proprio sul Giappone tra XVI e XIX secolo, dove si parla anche di questa scoperta dell’anatomia, prime autopsie etc, e dell’immane lavoro di traduzione (o decodoficazione come giustamente fatto notare nell’articolo) dei testi di medicina occidentali. Sono rimasto stupito soprattutto di come anche la reale forma delle ossa fosse sconosciuta e suscitasse stupore. Pensandoci meglio immagino che la relativa “familiarità” che abbiamo noi fin dal passato con gli scheletri o loro rappresentazioni, dipenda dall’uso della sepoltura come pratica (fino a pochi anni fa quasi unica) per trattare i cadaveri. 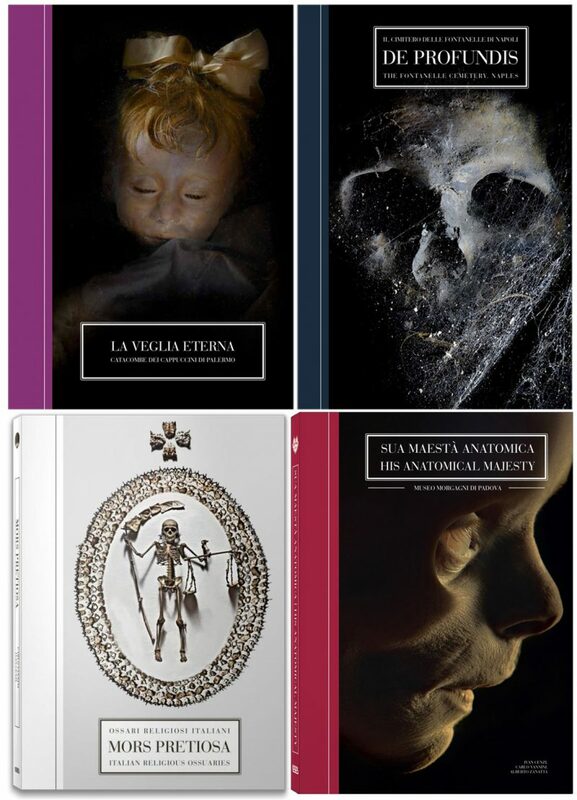 Riesumazioni, spostamenti, aree cimiteriali abbandonate, ostensione delle reliquie ecc credo abbiano fatto entrare lo scheletro nell’immaginario collettivo (usandolo anche come personificazione della morte stessa). 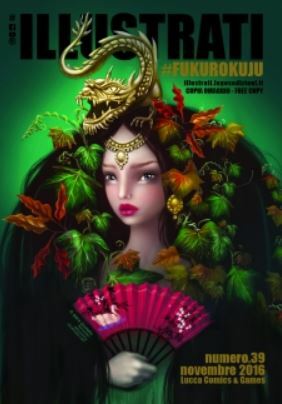 Mi viene quindi da supporre che in giappone si usasse quasi esclusivamente la crematura, e mi sembra di aver trovato conferma in rete che questo sia vero anche ai nostri giorni. Sempre complimenti per gli articoli!! A tal proposito, mi permetto di suggerirvi “Edo no karada o hiraku (Opening the Edo Body)”. Credo ci sia anche in inglese.